Hearing loss, even if only temporary, is a major health issue. Hearing loss can be caused by a variety of factors, including genetics, aging, and exposure to loud noises. Acoustic trauma and acoustic shock are both situations in which loud noises initiate hearing loss. 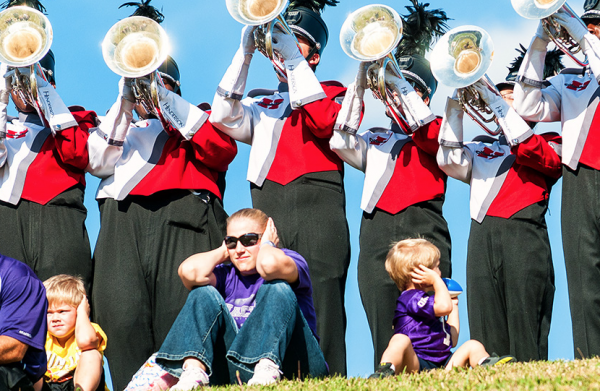 Some folks are more sensitive to loud noises, especially if they are already experiencing some kinds of hearing loss. In all cases of loss, the key is to seek treatment early and get the rehabilitative help needed. Damage to the ear by noise is often referred to acoustic trauma. An example of such trauma includes a loud explosion which affects the ear drum, leading to hearing loss. This loud explosion could be a singular event or it might be the result of visiting a loud music venue or working with heavy loud machinery for a day. While much acoustic trauma is temporary, there can be lasting damage which limits the ability to hear within a certain range of high frequency tones. Acoustic shock, related to acoustic trauma, is a condition which arises after being exposed to unexpected loud sounds via telephones. Persons who work daily with telephone headsets often suffer from acoustic shock. Feedback oscillations, fax tones, or other high pitched tones can unexpectedly be transmitted within the phone lines and persons with headphones may experience discomfort. Exposure to these sounds causes a strong muscle contraction in the middle ear and there can be tearing of the inner membrane in the ear. The resulting symptoms include headaches, tinnitus or ringing in the ears, imbalance, neck or jaw aches, and other maladies. Continued exposure to acoustic shock can lead to permanent hearing loss. Loudness discomfort affects persons who have sensitive ears. This hypersensitivity is commonly associated with hearing loss. Persons who suffer from sensorineural hearing loss are particularly sensitive. As we age, the hair cells and fibers responsible for hearing are reduced. As a result, the body often overcompensates by asking all remaining fibers to produce a maximum sound. As a result, the dynamic range is narrowed or reduced in the ears and even normal conversational tones can seem uncomfortable. Loud noise can be discomforting for different reasons. If you go to music venues or work around loud machinery, it is advised that you take preventative measures to protect your hearing. Ear plugs are a decent way to reduce the likelihood of acoustic trauma. If you do work regularly in loud environments you should seek out high-grade ear muffs, designed to fully protect your ears. Persons with hearing loss who use hearing aids should make sure the aids are outfitted with automatic volume control to prevent overloading the ear with amplified sound. As with all medical conditions, hearing loss is best treated as early as possible. If you or someone you know suffers from apparent hearing loss, seek out help. Early hearing loss testing can provide baseline information from which you can make the most informed choices about treatment and rehabilitation. With proper care, hearing loss can be treated and you can continue to enjoy a life full of friends, family, and social activities. Daniel Shaw is a senior health advisor at a senior housing community. Daniel, regularly helps senior citizens find answers to their health and hearing questions. As well as to their friends and families. Daniel enjoys, the community atmosphere and loves taking walks in the evenings with some of its seniors.